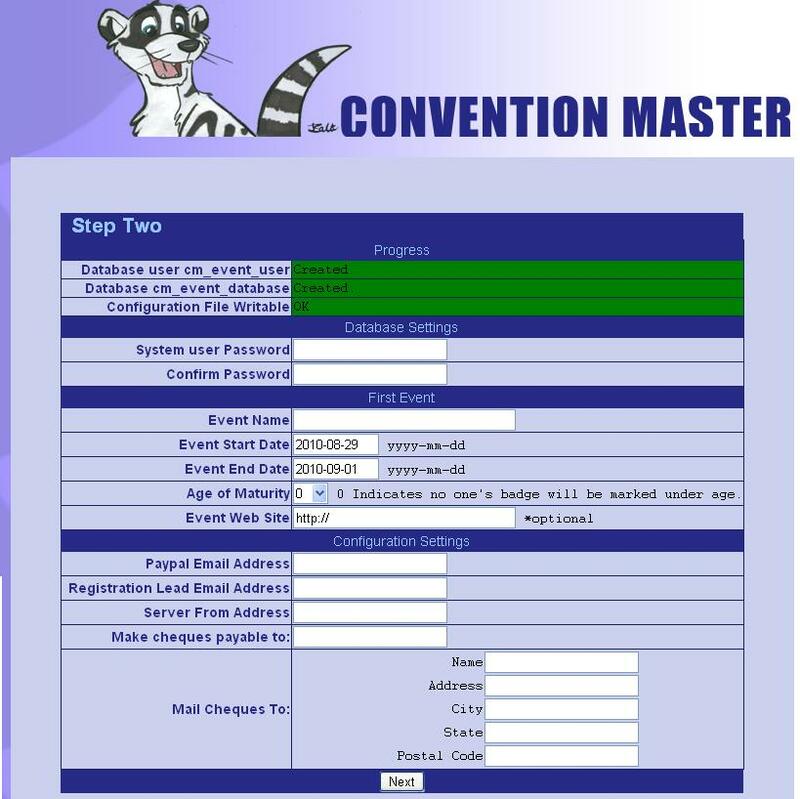 This document is intended to help walk you through your first installation of convention master. Set up the server - Download and extract the convention master software to whatever folder you desire it to be installed to. 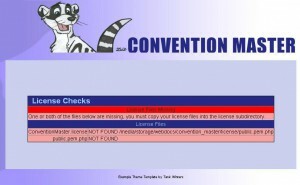 You can download the convention master program through any of the means described on the downloads page. Copy your license files into the license subfolder, once you have successfully copied the license files, press F5 or Reload on your web browser, and the license message should go away. if this happens, then simply set your folder permissions to writable for the web server and then press F5 or Reload. Step one settings - The next step is to start answering setup questions. These questions cover the various properties of the setup of the system. Host / IP to database - This is the ip address for the database connection. Likely this should be left to 'localhost' if your database server is on the same computer as your web server. Database Username - This is the username that the system will be configured to connect to the database with. If the user doesn't exist, the system will attempt to create the user for you. Database User Password - This is the password for your Database username. Confirm Dbuser Password - Type the same password again to confirm you typed it correctly the first time. Database Admin Password - The mysql super-user password. Step Two Settings - Once the first settings are set, you'll be brought to the next screen with more information need, this time about your first event. System User Password - The system user is a special user for the convention master software. It's the convention master super-user. This user is always there, so make sure your password is a good one. Confirm password - Type your system user password again so that you are sure it was typed correctly the first time. Event Name - This is your first event's name. This could be something like "Gold Conference 2010" or whatever your event is commonly known as. Event Start Date - This date is the date that your guests will be arriving at your event. Event End Date - This date is the last day of your actual event. Age of Maturity - Some events need to notify guests that some attendees are under age. If you want your event badges to distinguish between people of a certain age, then set this to somthing other than 0. The members below the age you set here can have badges that print out differently than adults. Event Web Site - This is optional, but is essentially a link to the website for your event to be used when sending links to customers. Paypal Email - This is the email address of your paypal account for collecting money. Registration Lead Email Address - This address is the email address of the person people having trouble registering should contact. Make Cheques Payable To - This is the name that people should make cheques or money orders payable to. Mail Cheques to - This is the address information for mailing in cheques and money orders. Step three settings - This last screen processes your information and finishes the install. Once it's complete you should see a screen like below and should be able to follow the link to your event console.